Feel free to email the page at minipiginfo@gmail.com if you see an error, We are not endorsing or supporting any of the vets listed here. All of the veterinarians or practices have been recommended by other pig parents as one that sees mini pigs and has, at least, a basic understanding of mini pigs. This list is NOT necessarily veterinarians who are "experts" about pigs, although some absolutely are. Much like you would choose a doctor for yourself, it is expected that you would do the same when choosing a veterinarian for your pet pig. 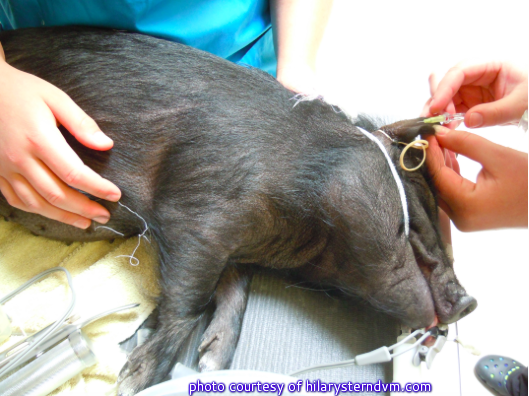 Ask questions, find out how comfortable your veterinarian is with caring for a mini pig. Find out about their availability, emergency plans, whether or not they're able to come to your home, etc. You are not forced to use any particular veterinarian, but you should establish a relationship with your mini pig and veterinarian sooner rather than later. Do NOT wait for an emergency to find a vet. If the word CONFIRMED appears under a vet or practice name, this means someone has called and confirmed that the particular veterinarian/practice still sees pigs. The list has been updated, but please be sure to call before showing up at the office as you would with any vet. If you know of a vet that isn't on the list, please email us with their information so they can be added - minipiginfo@gmail.com. This list has been complied by myself and others in the mini pig community for a number of years, and during the long process of verifying individual veterinarian practices see pigs, there were some practices removed from the list and many more added. Occasionally there will be practices that have undergone internal changes and they no longer see pigs, or new veterinarians join practices that didn't see pigs in the past, which now do-this vet list will change frequently based on circumstances beyond our control. We try our very best to add new vets and remove vets whose practice no longer sees pigs, doesn't want to or shouldn't. (Based on complaints from pig parents who have used them) If you see a vet that should be removed, let us know. If you know of a vet that isn't listed and should be, let us know. ​**** Please don't wait for an emergency to find a veterinarian, please find a vet that sees pigs and develop a relationship with a them as soon as you get a pig. Please check out our vet map we created by clicking here, University vets that see pigs by clicking here and also additional ways/links to find a vet by clicking here. If you have a question you need answered right away, this is a link you can click and chat online with a vet that is familiar with pigs. There is a fee for this online consultation, but the advice may be priceless. http://www.justanswer.com/pig. It is important to find a vet that has a specialty or subspecialty with pigs/swine. All of these specialty fields require three to six years of training beyond veterinary school; in addition, specialists must recertify their specialty degree every 10 years. It is an arduous process, and veterinarians must be dedicated if they want to be called “specialists" in their field and this will ensure your vet knows how to manage and care for a pet pig. We confirmed that these vets see pigs at their practice but do not know whether they specialize in pigs. You can also do a Google search for Large Animal Veterinary practices in your state or county/city to locate vets that MAY be willing to see your pig. 2036 E Northern Lights Blvd. *Only open when other vets are closed. Loomis Basin Vet Clinic INC.
*Can help you find someone in your area. Search engine only. Clay Duval Mobile Vet Service, P.A. ​Click here to read her story. 4620 W. Cedar Hills Dr.
751 N. Road 700 W.
3699 W. Main Street Rd. 1794 0r 1808 South Taylor Rd. Maria Stein Animal Clinic Inc.
680 W. Mason Morrow Rd. Grady, McClain, Pottowatomie, Seminole, Hughes, Okfuskee, and Payne counties. 13220 E. Wade Hampton Blvd. Gateway Animal Care Group, L.C. 901 N Interstate 35 Service Rd. 1892 East Fort Union Blvd. Services Chesterfield, Richmond, Hopewell, Charles City, Powhatan, Amelia, New Kent, Petersburg, Mechanicsville and Dinwiddie. 11105 E. Dishman Mica Rd. Bill Crank Veterinary Hospital Inc.
*Treats Miniature varieties but may not cover all services. Can refer out. 1350 S. Fish Hatchery Rd. 501 E. Riding Club Rd. 18 - 145 Carlton St., St.